← Right-Wing Monarchists and Left-Wing Republicans: The Inevitable Partisan Politicization of the Crown in Canada? Nathan Tidridge has written an excellent and accessible introduction to constitutional monarchy in Canada – its history, heraldic symbols, role in the constitution – and the evolution of the Crown in Canada and the Crown of Canada. Tidrigde effectively differentiates between the Queen of Canada, the Governor General, and the Lieutenant Governors; and it explains the Crown in relation to First Nations, heraldic symbols, and the Armed Forces. Overall, Canada’s Constitutional Monarchy strikes a fine balance of offering accessible explanations for a wide audience eager to learn about our system without compromising constitutional accuracy. It even shows the more jovial nature of the Canadian Crown through the use of an iconic painting of Queen Elizabeth II and moose. 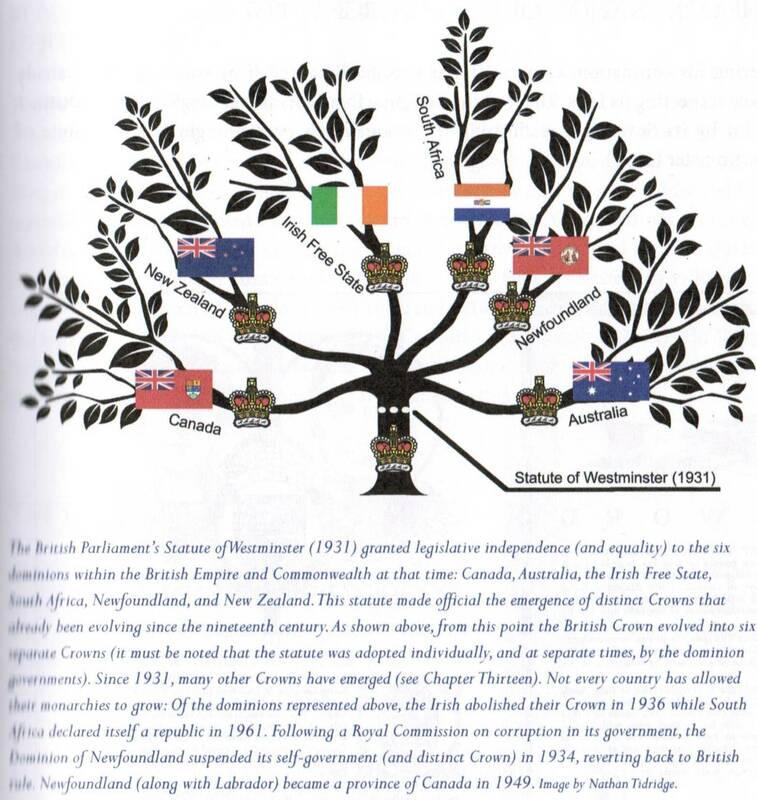 Tidridge’s diagrams illustrating the some key constitutional functions of the Crown are particularly instructive. The following images effectively explain the significance of the Statute of Westminster of 1931, which formally established the Crowns of the Dominions as legally separate entities. The Dominions started out as Crown colonies, but as responsible government developed in the United Kingdom, the British Cabinet (rather than the reigning monarch) exercised practical control over policy affecting the Dominions. The legislatures of the Dominions were therefore not sovereign; they consisted of the King of the United Kingdom, and their upper and lower houses. This colonial control extended to the Governor General, who used to function as an agent of the British government that nominated him. 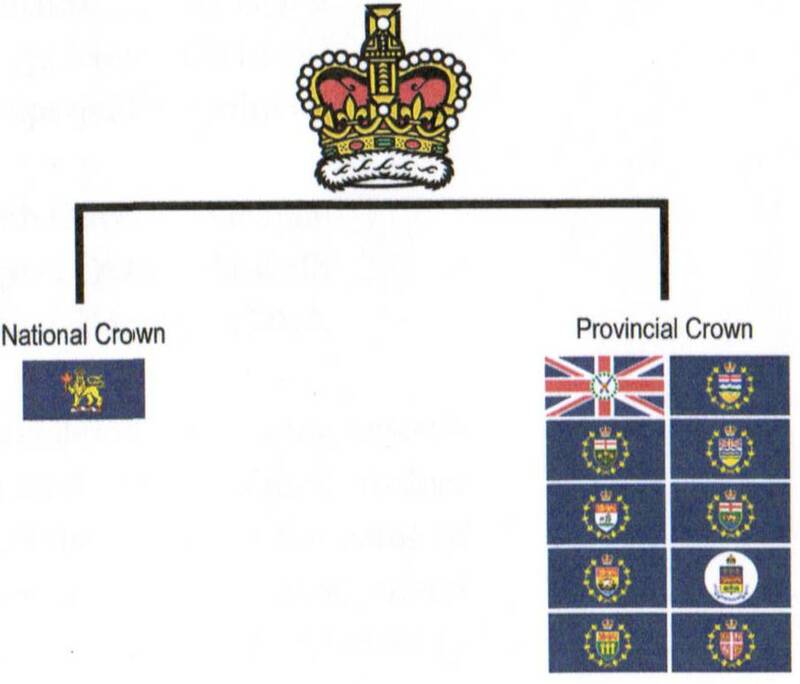 But the Statute of Westminster, as this diagram shows, fundamentally altered that relationship by establishing a personal union of legally separate Crowns such that, for instance, the Parliament of Canada consisted of (at the time) the King of Canada, the Senate, and the House of Commons. The Governors General also became representatives of the Dominion Crowns rather than agents of the British government. Canada’s Constitutional Monarchy also includes an approximation of what the constitutional scholar David E. Smith has dubbed “the compound monarchy” that constitutes Canada as a federation. The diagram depicts the classical federalism that the Judicial Committee of the Privy Council shaped in Canada: the provinces and the federal are co-equal in their spheres of jurisdiction. Parenthetically, republicans often overlook the Crown in its capacity as the guarantor of Canadian federalism and rarely explain how their new form of government would take into account the void left by the elimination of the provincial Heads of State, the Lieutenant Governors. I highly recommend Canada’s Constitutional Monarchy. This entry was posted in Articles and Books, Reviews and Critiques, The Personal Union and tagged Compound Monarchy, David E. Smith, Nathan Tidridge, Statute of Westminister. Bookmark the permalink.